At 9:03 p.m., it was pretty clear that the outer reaches of the Democratic dream election night was going to remain, well, a reach. Progressive heroes of a new generation like Andrew Gillum and Stacey Abrams were going to be swept aside, the Senate was gone, and, at the moment at least, Republicans had flipped more Democratic House seats than vice versa. Also at 9:03 p.m., with less than a half of one percent of the precincts in, the election for New York governor was called for Andrew Cuomo. In a year in which the theory that proudly progressive Democrats could win across the board went up in smoke, it was a blowout in New York. By the time of this writing, the governor is up by more than 30 points in the vote counting. Cuomo’s coattails carried Democrats across the finish line in deep-red congressional districts from Staten Island to western New York. The State Senate seems set to deliver a solid Democratic majority for the first time in five decades. Less than two months after Cuomo fended off a fierce challenge from his left flank from Cynthia Nixon, he took the stage at his Election Night party and delivered a fierce defense of Cuomo-ism, that style of politics that eschews performative wokeness in favor of brute force pushing an agenda forward. Prominent progressive candidates like Beto O’Rourke and Ben Jealous had already gone down to defeat, and Cuomo took aim at a sector and a style of left politics that he has always abhorred, the kind that — from his perspective — favors seminar-room philosophizing and symbolic victories over concrete results for constituents. For most of his tenure, Cuomo has danced on the edges of the field of plausible Democratic presidential contenders. He seemed too snarling to ever be the kind of politician the left could fall in love with, too calculating for an era that prizes authenticity above all else. But he took dead aim at Donald Trump on Tuesday night, laying out a vision for the country that looks very different from his fellow Queens native. He buzzed the president for his comments after the Charlottesville white supremacy rally last year, recited the Pledge of Allegiance, and all but accused the president of racism, homophobia, anti-Semitism, and misogyny. Assembly never got to the governor’s desk, which allowed him (in theory at least) to make liberal gestures while still governing as a moderate. That gambit crashed apart back in September, when each breakaway Democratic state senator lost to a progressive challenger. Those challengers will arrive at the statehouse unafraid to buck the governor in a way that other lawmakers have been, and their demands are going to make New York the rival of California as a progressive capital, with better-funded subways, schools, and a social safety net. And more significantly, they come with a mandate to change the way Albany operates, calling for more transparency, tighter campaign-finance rules, and a reform of New York’s notoriously lax ethics laws. 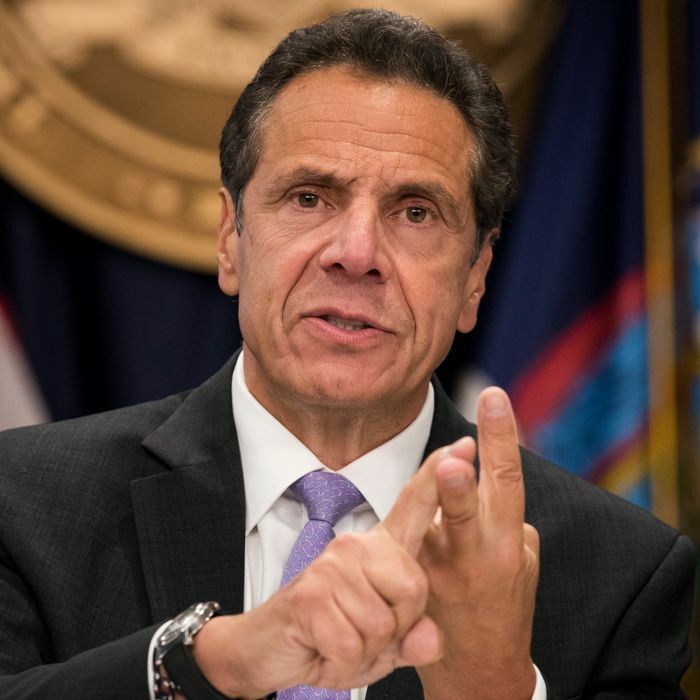 Cuomo moved sharply left after a liberal challenger ran against him in 2014, but it remains to be seen if he will answer the call for greater process reforms this time around. He has figured out how Albany works, and is unlikely to want to have much time for anyone who wants to muck around in the machinery of it. Plus, the governor hasn’t indicated if he will seek a fourth term now that he has won a third. If he isn’t running, the Democratic primary to replace him begins in a few short months. Or maybe sooner. Democrats across the country are going to be looking for heroes after a night that saw a number of possible presidential hopefuls go down to defeat. It is still hard to imagine the party faithful turning their lonely eyes to him. But now after a string of primary and general election landslides dating back to 2010, after saying he would carry a Democratic state senate and a handful of Democratic congressional candidates on his back and doing it, the governor wakes up on Wednesday as someone whose reputation as a master tactician remains unimpeachable. Just consider that speech in which he took on Trump. Cuomo is of course not the only New Yorker considering a run for president. Kirsten Gillibrand is often considered a far more plausible candidate than he is, Mike Bloomberg has more money than God, and even Bill de Blasio seems to think he has a following on the party’s left flanks. But Cuomo hurried to the stage to deliver his denunciations of Trump just before ten o’clock, giving the news networks just enough time to carry his speech if they wanted to. When it was Gillibrand’s turn, she talked about Trump, the women’s march, and lauded it as an “intersectional moment.” Then NY1, the all-news cable station that had been carrying her speech live, cut away. News was happening elsewhere.